Enjoy one of the most convenient locations for family living in New Westminster: steps from Herbert Spencer Elementary School, a short walk to Glenbrooke Middle School and still within easy walking distance to the soon-to-be-built, state-of-the-art new high school. Queens Park itself is one block away. Enjoy evening walks through one of the provinces most beautiful heritage neighborhoods. Retreat to your private oasis: like the rear yard with large flagstone patio area, cedar deck, and children's playhouse, swing and climbing wall. 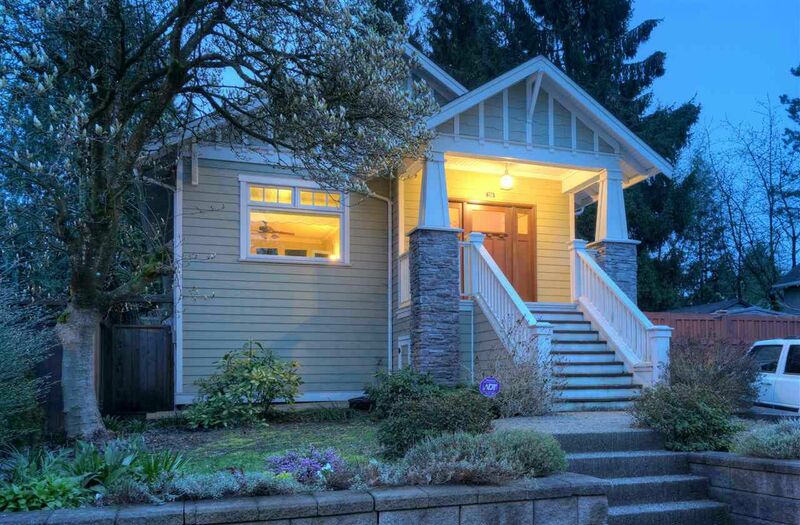 This charming 1923 heritage bungalow has been tastefully updated with wood double-windows, new electrical, and a modern kitchen with 9' Beach wood island with breakfast bar. An addition creates a delightful family dining area that walks out onto deck and patio. Nine foot ceilings on main. Two full bathrooms and four bedrooms. Two gas fireplaces complete this charming home. Excellent off street parking for several cars and a flex space used as sports court area or additional parking.